In addition to an amazing impromptu road trip and wonderful time spent with liret, rosefox, sinboy, karnythia, emilytheslayer, sparkymonster and MANY others, I got home and last night I had an awesome, hilarious sort of Whiskey Monday. There was a Balvenie rep there whom I didn't know, and everything was super lax, so rather than doing the typical formal tasting, Ellie and Chip and I just kind of sat at the table and kept asking him for more whisky. Then, Leslie and her friend Maggie showed up, and Brandy popped in (Can I tell you all how much I adore Brandy? Brandy picked me up and spun me around at Fourth of July and it was ridicutastic.) Mikey made us beer cocktails, and gave us shots for the road, and it was just lovely. Tonight, I went out for tacos with Angel and Marissa, at the place where their friend Lauren works. Angel is planning a secret surprise adventure for me and I'm completely stoked. I have no idea what it is. NO ONE EVER PLANS ME SURPRISES AND I LIVE FOR SURPRISES SO I AM THE HAPPIEST EVER ABOUT THIS. That is the weekend after next. THIS weekend, Jess and I are doing another road trip. This road trip works like this: Jess chooses the food she wants to eat, and I choose the place we stop to sleep based on what is optimal to engage Jess in the eating of her choice. We assume this will be ice cream. We will be doing this on the way to Washington, DC, to go to Becca and Katie's housewarming party. Then we will return to New York, and probably eat more things. THEN ONE WEEK UNTIL SURPRISE ADVENTURE. 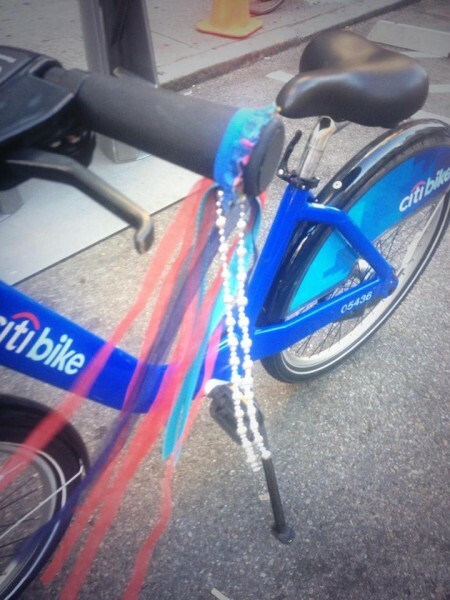 Also, I made tassels for Citibike. They literally took ten minutes and cost about $5. They take ten seconds to attach to a bike; I keep them looped around my helmet strap when they're not on. I love love love using them; I feel like I go faster with them. I kind of adore the quiet subversion of analog hacks to a public service that don't interfere with how anyone else uses it. I'm going to write up a little tutorial on how to make them. 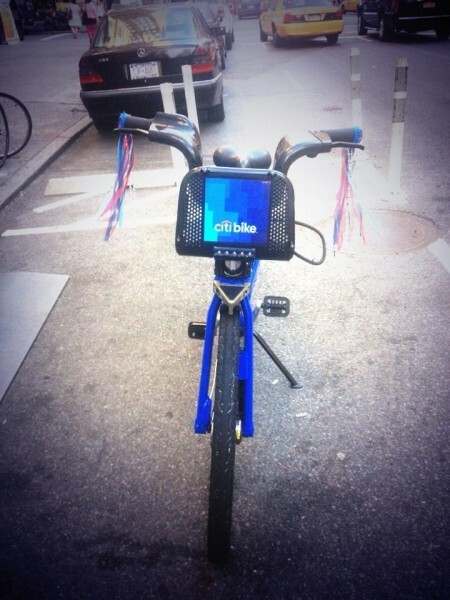 Next, I want to make a pinwheel that you can attach to a Citibike. I've been riding at least once a day when I'm in Manhattan. Yesterday, I rode from 54th to 37th at lunch, then from 57th to 26th after work-- and did my first ride down 5th Avenue, where there are no bike lanes. It wasn't nearly as nervewracking as I expected. I've also been riding from therapy to Ward III every Monday. It takes a little longer but it's so worth it, and I'm discovering the best route now and cutting down a bit on the time it takes me. Today I rode from 54th to 34th at lunch, and then from 54th down to Chelsea after work, where I hopped on a subway and went to Brooklyn to meet Angel and Marissa. The drawback right now is how sweaty my clothes are getting. It is going to mean washing my work clothes more frequently-- thank goodness I'm moving into a building where the laundry is open late. I like feeling sweaty and exhausted and achey and having my legs feel like jelly, though. It's a good kind of tired and sore and I know I am building up my stamina. There's a former coworker who still works in our building, and I ran into her on the elevator today. She asked me if I was working out. I said no, and then realized I've been cycling so much. I told her so. She said to me, "well, there's something different about you. It's like your back is straighter, your posture is better, you're carrying yourself taller. Like you're more confident. And your muscles are more toned." "Really?" I asked. "You notice that?" "Well, I don't see you every day. I think that's the only reason I'd notice." That made me feel good. The changes she described are not things I signed on to biking to achieve, but I'm not going to complain. Oooh, this may be a possibility? I think Baltimore might be a little further than we're planning on driving on Friday, but we'll see-- it's really all up to Jess since she's the driver. Wait, am I misreading - you're heading to DC for a housewarming, yes? Cause Baltimore is between DC and New York. Yes, but it depends how far Jess wants to drive Friday night since she'll be coming from Northern Connecticut. Baltimore is way closer to DC than to NY and the idea is to stop somewhere that will split up the driving for her. Oh, derf. I kinda meant you two could swing by and say hi and if you needed a bathroom or a food, I could offer those. Ahhh okay! We shall see, then. Possibly Saturday morning or Sunday when we leave? Hmmmm. If anyone was ever to bedazzle a bike, it would certainly be you!